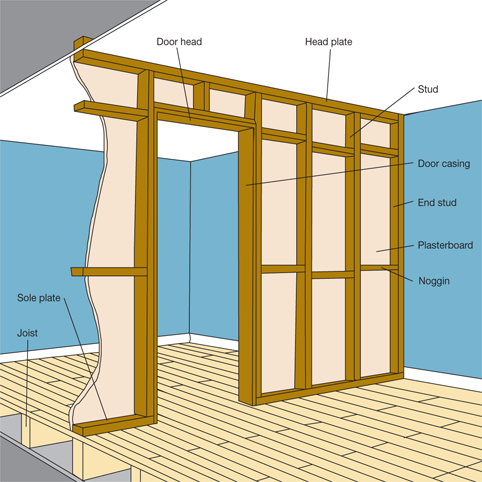 Summary: Learn how to construct a stud partition frame, position a stud frame, build head and sole plates, construct the studs and build a doorway. A non-load-bearing partition wall is made from plasterboards fixed on either side of a timber or metal frame. The timber frame is constructed of vertical timber (studs) fitted between ceiling and floor and horizontal timber studs (head plate and sole plate). The information here will help you to build a partition frame. On this frame you will need to decide what size plasterboard you require, and whether or not to have insulation. Before you start building the frame, you need to know the size of the door to build around. Therefore you should buy the door and its casing first. Measure the height for the door from the floor rather than the sole plate and avoid positioning a door right beside an adjoining wall. The first part of the frame to be constructed is the head and sole plates. These need to be nailed to solid floor and ceiling timbers, so you will need to locate the floor and ceiling joists. Floorboards always run at right angles to the floor joists, so the lines of nails will indicate the position of the joists. The easiest way to locate the ceiling joist is to use an electronic pipe and cable detector. This hand-held tool will also detect nails thus indicating the position of the ceiling joist. 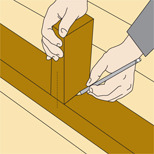 If possible, try to construct the frame in line with the floorboards, so it is at right angles with the joists. Alternatively the sole plate can be positioned over a single joist. 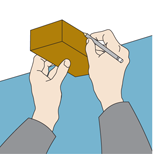 If neither method is possible, you will have to skew-nail timber noggins between the joists in line with where the sole plate is to be positioned. Similarly with the head plate. If it is not possible for it to run in line with a ceiling joist, or at right angles to one then you will have to lift the floorboards in the room above and nail timber noggins between two parallel joists. Use an off-cut to mark the position of each end of the head plate where the fixing points have been located. Then from these marked points, drop a plumb line and get someone to mark points on the floor where the sole plate is to be positioned. Temporarily fix the sole plate to the floor using 100mm (4in) nails at 600mm (2ft) intervals. 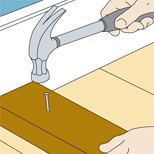 Drill into the ceiling joists or noggins and temporarily screw or nail the head plate into position. Again using the plumb line, check the two plates are aligned correctly. 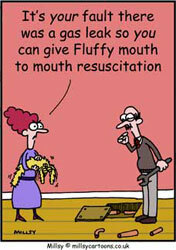 Make any adjustments at this stage. When you are happy with the position of the sole and head, fix the nails or screws in. Use an off-cut to mark the position of each end of the head plate where the fixing points have been located. Once happy with the position of the sole and head, fix the nails or screws in place. Mark lines on the sole plate every 600mm (2ft) where the studs will go, but make sure you take into account where the door will fit. These lines indicate the centre points for the studs. Taking the off-cut you used earlier, mark a vertical line down the centre on the side that is 50mm (2in) wide. Stand the off-cut squarely across the sole plate, aligning the marks with each other. Then you can draw lines around it as a template, to indicate the edges for each stud. Measure out the studs and cut them so they fit tightly between the head and sole plates. Push the end studs into place against the wall and check the faces are perfectly level. The bottom of the end studs will have to have a rebate cut into them so they can accommodate the skirting board. With the bottom of the stud resting on the sole plate mark with a pencil the guidelines for the rebate. Resting the stud on a bench with the wall-facing side upwards saw along the guideline indicating the depth of skirting board. With the stud firmly held use a bevel-edged chisel and hammer to chip away the wood to the depth required. The end studs must be fixed in a perfectly vertical position, so if a wall is not completely flat, fill the gaps with hardboard or vinyl tile. 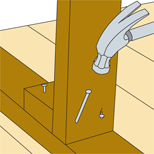 Fix the end studs to the wall using screws and wall plugs or 100mm frame fixings. The best way to fix the other studs into place is to first temporarily nail an off-cut to the sole plate against the stud (you will need someone to hold the stud while you carry out this operation). This stops the stud moving when you skew-nail it into the sole and head plates. Skew-nailing involves driving two 100mm (4in) nails diagonally down into the sole plate on one side of the stud, and doing the same with one nail on the other side. Use a spirit level to check that both sides of the studs are vertical before skew-nailing them in position. Fix horizontal noggins in-between the studs (which act as a support) halfway between the floor and the ceiling. Noggins can be nailed in either by the skew-nailing technique used earlier, or you can fix each of them in a staggered position so it is possible to nail them through the studs. Stand the off-cut squarely across the sole plate, aligning the marks with each other, then draw lines around it to indicate the edges for each stud. Temporarily nail an off-cut to the sole plate against the stud and skew-nail it into the sole and head plates. To fit the doorway, construct studs on either side of the door opening but make sure you leave space for hanging the door, about 2-3mm (1/8in) for the hinges, in addition to the thickness of the door casing. The door casing is a wood panel that fits around the inside edge of the studs and door head. It should be wide enough to span the width of the stud plus the width of the plasterboard on each side of the wall. The most common size is 100mm (4in), but you will have to check to be sure. Make a door head by inserting a noggin at the required height between the studs. If you are fitting a window above the door, then line the stud and noggin as well. Cut through and remove the section of sole plate that is still fixed to the floor at the base of the door.